I want to calculate the user online time, from the API response, by taking the first and last login time.. 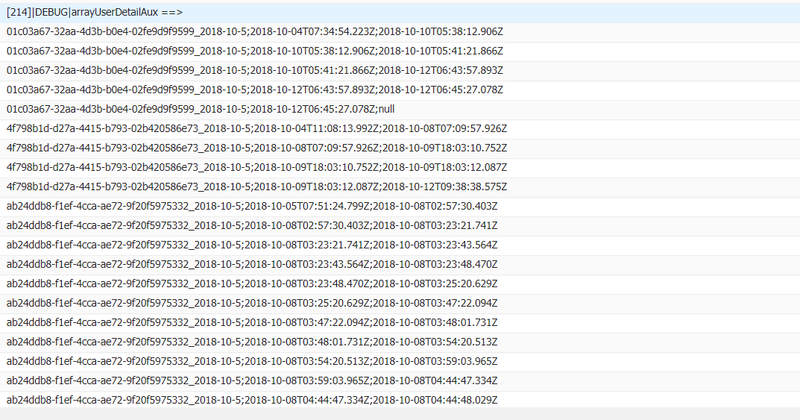 I tried to parse the JSON and store it in array of strings..
Theres UserID, Start Time, End Time, separated by ';' .. as you can see theres 3 userId (01c03a67..........) .. how do I get the start time from the first index and start time from the last index, for each userID? This type of logic problem isn't really unique to JSON. 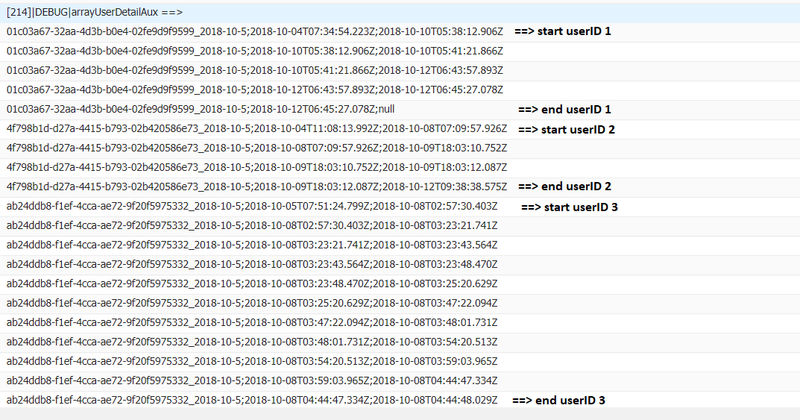 Fortunately, it looks like your array is already sorted by user Id and by the time of login events. You just need to maintain some state as you iterate over these entries so that you can tell, each time through the loop, if you've switched to a different user. I'll sketch this out in pseudocode, and you can refine the algorithm for your specific use case here. As you say, we're trying to find the difference between the earliest and latest login dates for each user. // and the values are the date differences. // Now, declare our state variables that we'll use to check where we are each time we iterate through the loop. // Now, loop through the input data. // Implementing these functions below is left as an exercise. // Now, determine whether we're changing to look at a different user or not. // user, since we'd need to do the calculation at that point. This is pretty rough, but it's meant as an example of how you can implement this type of logic - where you're adding more structure to a flat list of data items. You'll often have to maintain state across loop iterations in this type of fashion, and include logic to make sure you handle the start and end of the list appropriately. There are other ways you could execute this, of course. You could, for example, create a wrapper class to represent each log entry, preprocess the data into a Map<String, List<WrapperClass>> where each key is a user Id and the associated List contains each of their login entries, sort the lists (your wrapper class would need to implement Comparable), and then just check the first and last list entries. Fundamentally, though, it's a logic challenge - not specifically a JSON or Apex challenge. Once you pick the logical structure that works for your application, then you've just got to find the right idioms in Apex to implement it effectively. Note that in my original answer to Learn Parsing JSON, I was only putting the data into a string to demonstrate that the parsing was working. The parser has the data correctly split up already, so you should grab and process the various pieces directly into your final data structure. Not the answer you're looking for? Browse other questions tagged apex array or ask your own question.